Markov Chains is a probabilistic process, that relies on the current state to predict the next state. 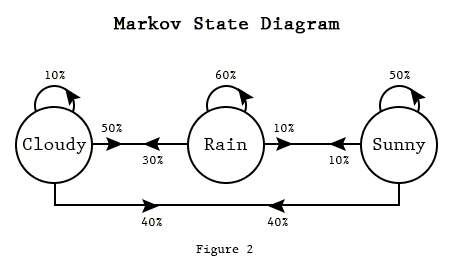 For Markov chains to be effective the current state has to be dependent on the previous state in some way; For instance, from experience we know that if it looks cloudy outside, the next state we expect is rain. We can also say that when the rain starts to subside into cloudiness, the next state will most likely be sunny. Not every process has the Markov Property, such as the Lottery, this weeks winning numbers have no dependence to the previous weeks winning numbers. 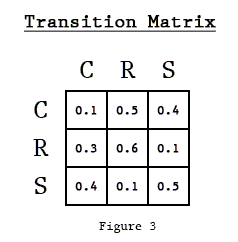 The Transition Matrix transitions from Row to Column as in the Markov Table. We can do calculations with a Transition Matrix utilizing a State Vector(vector of our current conditions) to give us the probabilities of the next states. 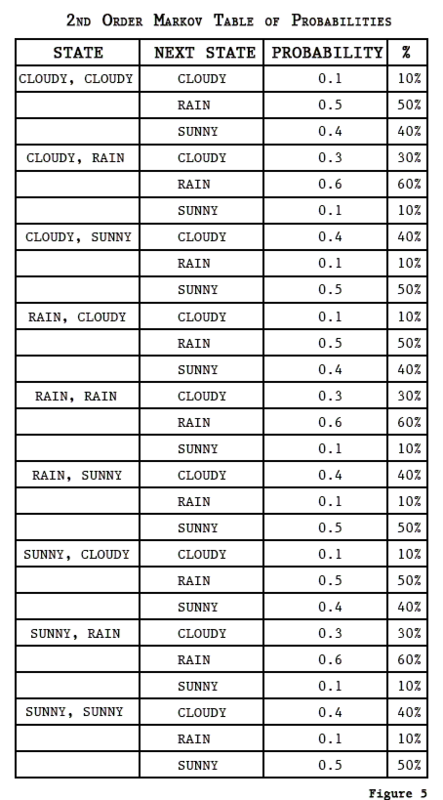 Rain most likely again, and we can calculate the probabilities of the state after that by multiplying with figure 2 again. That is the method of the Markov Chain of probabilities. Markov Chains do go more in-depth and I've only touched the surface. 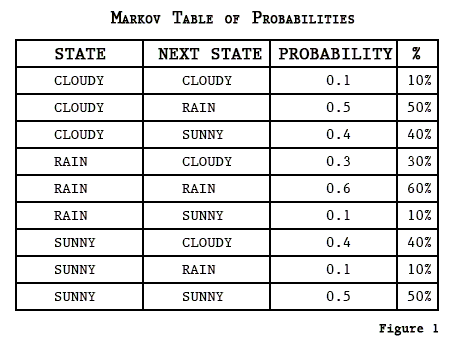 When programming Markov Chains most developers use the table method, linking a list of states to its list of next state probabilities. One toy program that people like to mention synonymous with Markov Chains is the Markov Chain text generator, trained on text, basically the states are words, and each word is linked to a list of words that have appeared after it in the training text. Here`s a quote from my 3rd Order Markov Chain Text Generator trained on the Bible "Then Joshua said to the olive-tree, Be king over us." This tutorial is not complete - I will be adding pseudo-code, and turning the calculations into images. Just keep going. All posts are simple to understand. Would love to see the code to generate that quote. Thank you for the effort. Your blog looks very promissing. Excellent work explaining Markov chains. This is the first time I understand a concept online in one read through. Best introduction in Markov chains so far. Thank you! I was facing difficulties understanding HMM. Your post is very helpful. Thank you for writing this. It is probably the most illuminating introduction that I could find. Well explained with really brain friendly way. Thank you. You are genius thanks dude..! In the process of writing a tutorial on Particle Swarm Optimization.